How can I create a private space for individual students in Moodle? How can I create a private space where tutors for my course can communicate? How can I make objects in the course visible or invisible to students? Where have my Navigation and Settings blocks gone? All but one of my topics have disappeared. How do I get them to display again? I can't edit anything in my course. How do I get into editing mode? I can't drag-and-drop items on the course home page—what's going on? How can I rearrange blocks on a Moodle page? I need to see how my course will display for a student. How can I organise this? My students aren't responding as requested to forum posts. How can I get them to follow the discussion? My email inbox is crowded with notifications about Moodle assignments. How do I make it stop? I've accidentally deleted my News forum! What can I do to get it back? How do I hide my students' grades from them? Why is the link icon greyed out in the text editor? How am I supposed to create a link? How do I link from a book or web page to an individual topic on the course home page? How can I add a link to an external application that will always be visible on the course home page? How do I link to a file, video or image inside a book chapter? How can I link to an activity from inside a book? How can I see a list of all the students in my course? How can I make notes on this list about individual students, or groups of students? How can I view a history of student activity? What are "groupings" for? Can't I just use groups? How can I post to a specific group in a separate groups forum? How can I add teaching staff to my course? How do I give an individual student special access to a quiz? I need to see how a student will view a course I'm creating. Why can't I log in as one of my course's participants? I am using enquiry based learning for a course. One assessment task requires students to keep a "research notebook". How can I create a private space for individual students, in Moodle? Create an OU blog. 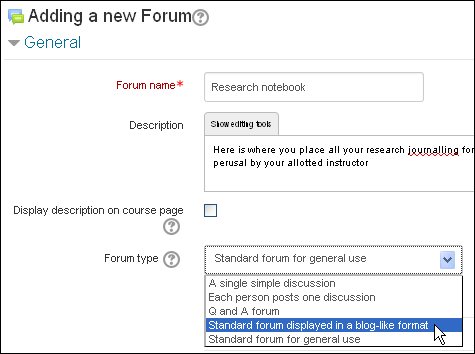 On the Adding a new OU blog page, from the Individual blogs drop-down list select Separate individual blogs, so that a student can only view or post to their own blog. You can also use Moodle's online text assignment tool. Students type their journal or notebook entries directly into Moodle and the teacher provides feedback. For help using the online text tool, see moodle.docs. Creating a discussion forum "displayed in a blog-like format" is another possibility. To make it private, you would have to create a single-member group for each student. Beyond Moodle, the Mahara ePortfolio system has a dedicated blog tool. Blogs can be kept private and can be graded. Click the following link to go to the Mahara pilot project wikispace. after forum creation, going to the course home page and clicking the Hide icon to make the forum invisible to students. Or you can create a group within a grouping, and place your tutors in it. Create or edit the forum to make it only available to the grouping. Edit the Visible: Show/Hide setting. Instructions. Edit the Restrict Access setting using dates. Instructions. Where have my Settings and Navigation blocks gone? Hover your mouse pointer over the relevant tab. The block displays next to the tab. Click the Undock this item icon . The block displays in the block column. With editing turned on, click the Show section icon for each of the hidden sections. The remaining topics will display. Does the Turn editing on button display at the top right of the screen? If yes, click it to enable editing. If the Turn editing off button displays instead (meaning that editing is enabled), your screen may have frozen for a reason unrelated to Moodle. Try logging out of Moodle and logging in again. Click Turn editing on . In the Settings block, select My profile settings, then Edit profile. You can view your course much as a student will see it by switching roles within the course. Note that this view does not always reflect exactly what a student will see. Edit the forum settings. For Subscription mode, choose Forced subscription. An email will be sent to each student every time a new post is made to the forum. If students complain that forum post notifications are becoming a nuisance, suggest that they edit the Email digest type in their profile, so that they receive all forum posts in a single daily email, rather than getting an email for each post submitted. Visible groups (where a group has read-only access to other groups’ work, for limited privacy). For Grouping, select the grouping. Select the Available for group members only check box. Complete the rest of the page as appropriate and Save your changes. My email inbox is crowded with notifications about Moodle forum posts and assignment submissions. How do I make it stop? If you don't have permission to edit the forum or assignment settings, you can reconfigure your personal notification settings so that you only receive one daily email from Moodle, rather than individual notifications from every tool, about every submission. If you have editing permission, update the forum or assignment, selecting No at Notify graders about submissions. Follow the instructions for lost News forums. On the Edit settings page, there is a setting, Show gradebook to students: If you leave this setting as Yes, a student can view a list of all their grades for the course by clicking a Grades link in the Settings block. Note that if you select No, students can still see their grade for each assignment by viewing their assignment submission page. To completely hide a student's grade from them, you must, in the Gradebook, hide the individual assessment item, or its category. For more information, see the Moodle Docs page on Grade hiding. Select some entered text in the box to be the link text. The link icon will then become accessible. On the course home page, hide all the topics except the one you want to link to. Do this by clicking the Hide section icon at the right of each topic . The Show section icon will replace it. Copy the resulting page's URL. In the book or on the web page, create a link using the copied URL. When the user clicks this link, the single-topic course page will display. Click the Show icons for all the hidden topics to make them visible again. This page contains video and written instructions for inserting these types of content into book chapters. In a new window, log in to the course as a student. Return to the course where you are logged in as an instructor. In the relevant book page's text editor, create a link. In the Insert/edit link window, paste the address into the Link URL field. Follow these instructions to add a note to the Participants list about a specific user, or to "Add a common note" that applies to more than one user. You can specify that these notes be only visible to you, or visible to all instructors in a course. A third choice is available to make them site-wide, but this choice is not recommended. Groupings are used to restrict access to an activity or resource to a subset of groups. You cannot use groups without groupings; to assign an activity, or release a resource, to a select group of students, the group must belong to a grouping—even if the grouping only contains one group. 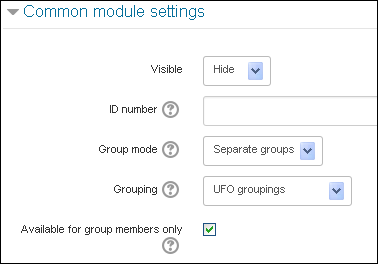 Click the following link for information about creating groups within groupings. How can I post to a specific group in a "separate groups" forum? Add staff to your course in myUNSW. Follow the instructions on this page. Note that your ability to add them will depend on whether they have records in the HR staff database. You may need to speak to a school administrator about setting up some staff with HR records first—for example, setting up senior students as teaching assistants in a first-year course. You cannot log in as a specific student user to a course that you have not yet released to students. The "log in as" feature can only be used in available courses. The closest you can come to the student experience is to Switch role to Student in the Settings block.